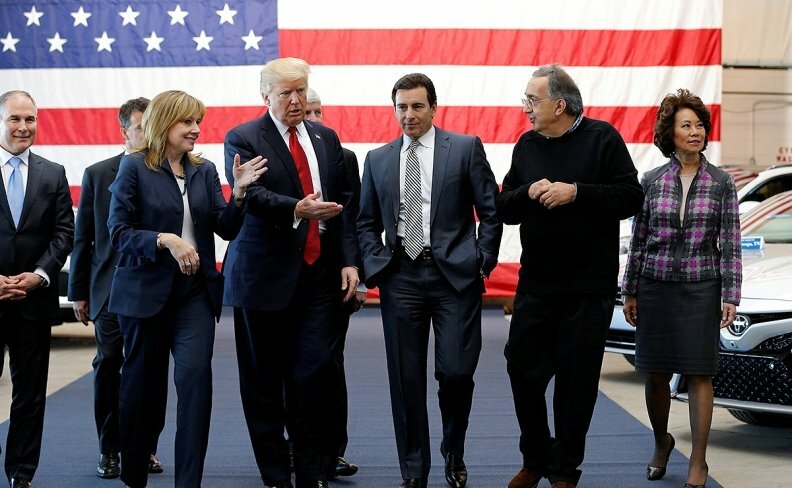 Trump met with top auto executives early last year in Michigan. President Donald Trump on Wednesday called Canada “difficult” and predicted U.S. automakers and auto workers will be “very happy” with the outcome of talks over the North American Free Trade Agreement. The president was asked about the status of the NAFTA talks. It came after he tweeted earlier in the day that there will be “big news coming soon” for auto workers. Trump said both Mexico and Canada have been “very difficult to deal with” and he's “not happy” with their requests. Treasury Secretary Steven Mnuchin has said that efforts to renegotiate the trade agreement could spill into next year. "There will be big news coming soon for our great American Autoworkers. After many decades of losing your jobs to other countries, you have waited long enough!" Trump said in a tweet. NAFTA talks have been stalled by a dispute over auto provisions. The United States and Mexico have been deadlocked over U.S. demands for wage increases in the auto sector and for a boost in the North American content of cars made in the three NAFTA nations. Critics complain the demands are a clear swipe at Mexico, which Trump says added low-wage manufacturing jobs at Americans' expense after NAFTA was signed in 1994. It was not clear, however, whether Trump’s tweet was referring to a possible breakthrough in the talks. Last week, the top U.S. trade official said the three countries were "nowhere close to a deal." Flavio Volpe, head of the Canadian Automotive Parts Manufacturers Association took to Twitter wonder and speculate about the possibilities. "New tariff threats? Did the Chinese agree to put a car plant in the USA?" Volpe asked.